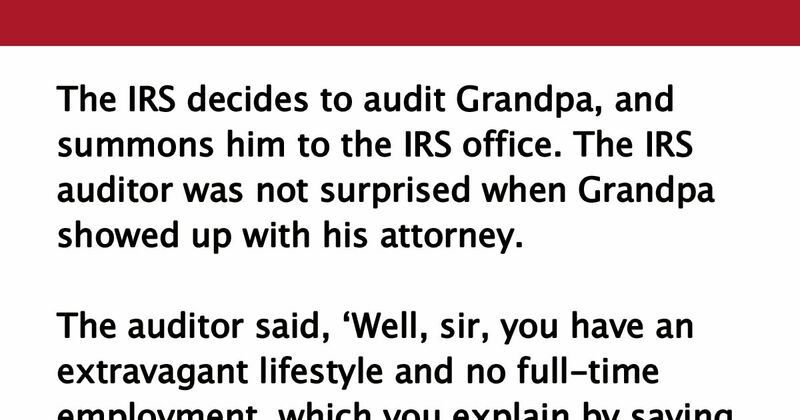 Grandpa Challenges IRS Auditor During An Audit. What He Does Is Just Perfect! The auditor said, "Well, sir, you have an extravagant lifestyle and no full-time employment, which you explain by saying that you win money gambling. I’m not sure the IRS finds that believable." "I’m a great gambler, and I can prove it," says Grandpa. "How about a demonstration?" The auditor thinks for a moment and says, "OK. Go ahead." Grandpa says, "I’ll bet you a thousand dollars that I can bite my own eye." The auditor thinks a moment and says, "It’s a bet." Grandpa says, "Now, I’ll bet you two thousand dollars that I can bite my other eye." "Want to go double or nothing?" Grandpa asks. "I’ll bet you six thousand dollars that I can stand on one side of your desk, and pee into that wastebasket on the other side, and never get a drop anywhere in between." The auditor, twice burned, is cautious now, but he looks carefully and decides there’s no way this old guy could possibly manage that stunt, so he agrees again. Grandpa stands beside the desk and unzips his pants, but although he strains mightily, he can’t make the stream reach the wastebasket on the other side, so he pretty much urinates all over the auditor’s desk. "Are you OK?" the auditor asks. "Not really," says the attorney. "This morning, when Grandpa told me he’d been summoned for an audit, he bet me twenty-five thousand dollars that he could come in here and pee all over your desk and that you’d be happy about it." Don’t mess with old people! Do you know anyone who'd do this? Make sure to SHARE this hilarious story with your friends on Facebook!